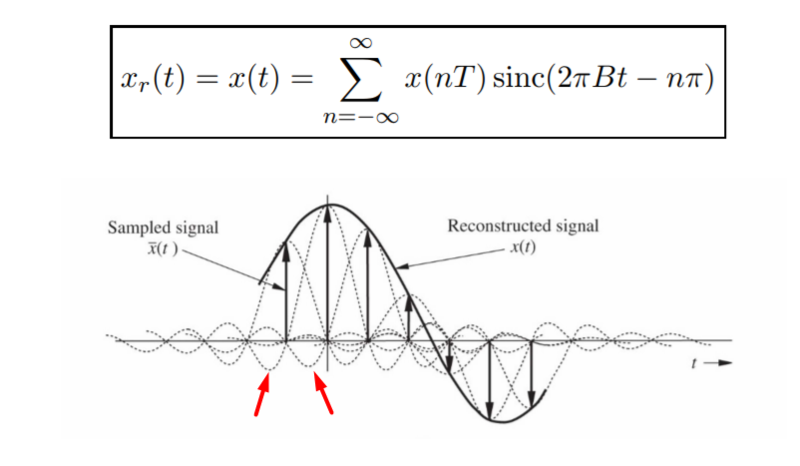 I'm trying to write a program in Matlab that samples (using Nyquist theorem) and recovers signal. I got stucked on recovery part...recovery signal doesn't match with the original one (see photo). And I have to make graph that shows every sinc separately (before the sum) like on photo. Also I have to use formula from photo. What I need to change and add? Thanks in advance! You are pretty close. Here is a hint: you need to make sure that your sinc pulses are lining up with your samples. You can check this by breaking it down and plotting individually the sinc pulse train that you are getting. Make sure that these line up as shown in your picture and you should be good to go. Not the answer you're looking for? Browse other questions tagged matlab sampling or ask your own question.